Operation War Diary is a new joint project between The National Archive (providing the documents), the Imperial War Museum (providing the historical expertise) and Zooniverse (providing the technology community software) is recruiting citizen historians to index these war diaries. The project is online at www.operationwardiary.org. During WWI each unit kept a war diary. There are over 1.5 million pages within these diaries telling the stories of what was happening on any given day during the war. This is where you have the opportunity to put your soldier into context. The diaries originated as a result of Field Regulations Part II issued in 1909 and reprinted in 1913, stipulating the purpose of the war diary and how the diary was to be completed. However, every diary is different. The goal of this new project is to “classify each page of every diary”. Indexing the war diaries will reveal questions about: military activity; people; weather; army life; and casualties. The website provides a Field Guide to the diaries with examples of the different pages – cover, diary, orders, signal pads, reports and other documents (e.g. maps) and lists what is hoped will be tagged and indexed on each of these pages. There is a 10 minute tutorial on how to tag and index, which is very good. You will need to register first and then you can start tagging. Currently 31 diaries are online in various levels of completion. The site states that eventually everything from Operation War Diary will be available to everyone free of charge. The stated purpose is to “classify each page of every diary”, however on the About Us page is states that The National Archives has digitized the war diaries of the units under the command of the British and Indian cavalry and infantry divisions on the Western Front. This makes me wonder if other Fronts such as Gallipoli or Mesopotamia will be included later. Personally I hope so as I have a soldier dying at El Kut in Mesopotamia and I would like to read that war diary. There is also a discussion section where images can be posted of problem pages, help requests, or exciting finds. This is a very active section, for example 12 images with questions posted within the last hour. I have read some war diaries in the past, but logging in and starting to tag the data really helps you appreciate the depth of details that are here about the lives of our soldier ancestors. The process was simple, fun and educational. If you have WWI ancestors, come join us in this worthwhile project. I mentioned in my opening post for 2014 that this year I would be taking a look at some of the WWI military records available to family historians in detail. The Centenary is going to be a big event over the next five years as we recall what happened and the effect it had on our families. One of the institutions highly involved in the centenary is the Commonwealth War Gave Commission (CWGC). We will learn more about their records later. of WWI. 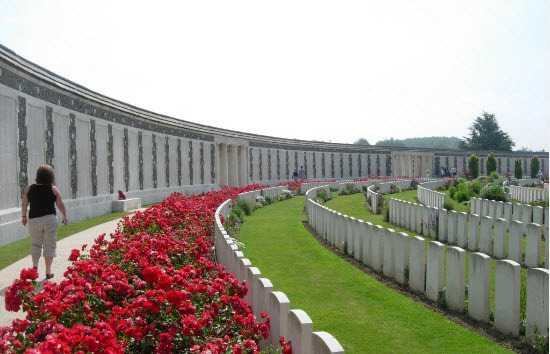 The sites may be a single headstone or a large cemetery such as Tyne Cot at Ypres in Belgium with over 7,500 headstones. Visitors to these sites have been increasing and are expected to increase dramatically with the centenary. To prepare the CWGC has identified five “iconic” sites in France and northern Europe. These are Tyne Cot (Ypres, Belgium), St. Symphorien (Mons, Belgium), Nieuwpoort Memorial (Flanders, Belgium), Menin Gate (Ypres, Belgium), and Island of Ireland Peace Park (Messine, near Ypres, Belgium). The preparations include: replacing and re-engraving of headstones; renovating and replanting borders and gardens; replacing panels and renewing paint in the engraved names on memorials, and much more. More details about the preparations can be read in a story entitled “War Graves commission face major WWI challenge” from December 28, 2013 issue of The Scotsman. The CWGC publishes a monthly newsletter keeping readers informed about what is happening around the world. One story in the January 2014 issue that caught my attention referred to a gravesite being located for a British Airman – Second Lieutenant Philip Frederick Cormack, 204th Sqaudron, Royal Air Force who until now has been commemorated on the Arras Flying Services Memorial (meaning there is no known grave). He is in fact buried in the French Military Cemetery in Machelen, East-Flanders in Belgium. The CWGC continues to identify and locate the bodies of the fallen. Thanks to Chris Paton at The British GENES Blog (Genealogy News & EventS) for brining both these items to my attention. In my last post I reflected on the happenings of 2013. In this post I will use the same themes and share what I have planned for 2014. Blog and Writing – On the blog I will continue to highlight and review new online and print resources. If there is a topic that you would specifically like to know about let me know and I will see how if I can point you towards good resources. In addition I want to focus on the fact that 2014 is the centenary of the start of World War One. Almost anyone with family connections in the British Isles in 1914 will have someone who served in the war or was affected by the war. All the new online indexes are making it so much easier to find family members who served in one of the branches of the armed services or the auxiliaries. What I am finding though is that students don’t appreciate what they have found, what the records contain, or what clues they provide to go to the next step. I plan on examining some of the records in detail and demonstrating how to go further. I am also working with a good friend, a technologically savvy genealogy blogger, to provide mutual support to write for our blogs on a consistently regular basis. The hope and expectation is that we will both post on a more consistent schedule. In other writing, I am working on a manuscript explaining the records within the English Parish Chest, to be published by UnlockThePast. I will let you know when my new book, already with the publisher – Discovering English Parish Registers becomes available. I will also continue doing my reviews for the Federation of Genealogical Society’s FORUM magazine, plus for the newsletter of the British Interest Group of Wisconsin and Illinois (BIGWILL). Genealogical Speaking – I teach an English track and a Scottish track at the Institute of Genealogy and Historical Research at Samford University in Birmingham, Alabama as part of a three year cycle with David Rencher teaching the Irish track this year. This therefore is my year off while David teaches. Instead I will be teaching a week long program for the 2014 British Institute – Scottish Research: Understanding the Fundamentals and Beyond – October 20-24 in Salt Lake City for the International Society for British Genealogy and Family History. Plan on coming to join me for what will be a great learning opportunity. I will also be lecturing at both national conferences – National Genealogical Society conference in Richmond, Virginia (May 7-10) and the Federation of Genealogical Societies Conference in San Antonia, Texas (Aug 27-30). In addition there will be a number of regional and local events. Keep an eye on my schedule for a more complete itinerary. Personal Research – I hope to make some time for my own research, especially my Milner, Finnigan and Doran lines. I will try to share some of their stories. I will be using my World War One focus to explore and learn more about my many family members who served and died during the war. Please Join Me in this journey by reading my blog regularly, which you can do by subscribing to the RSS feed or subscribing to an email version of this blog. If you know fellow researchers with a British Isles interest do not keep me a secret, let them know you are reading my blog and suggest they may enjoy it. Happy Hogmaney to all my readers. Let’s all enjoy 2014 and do good research.